AAA State of Play Blog: The ABCs of Why Play Matters! Play offers far more than just fun and games. It is an essential ingredient to a child's physical, emotional, and social development! When kids play, they are exploring natural sources of self-expression, creativity, and learning. So, let's celebrate play using the basic building blocks of education - our ABCs! B - Bouncing, jumping, swinging, dancing, sliding, hopping, running! 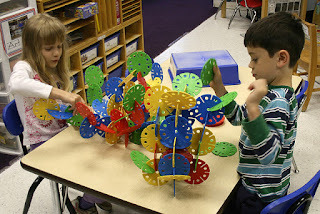 Play is fundamental to gross motor development in children. The more kids move, the more they will understand their bodies. K - Kids need at least one hour of physical exercise each day to fortify their physical health, jump-start their creative problem-solving skills, and prep their brains for absorbing educational material. Playgrounds and sports are a fun way for kids to partake in motion. O - Open-mindedness begins on the playground. Play creates a safe, natural environment where kids can engage with others, share ideas, explore a variety of cultures, and find their own voice. Q - Quality time spent playing with family and friends creates memories and builds bonds that last a lifetime. As Plato once said, "You can discover more about a person in an hour of play than in a year of conversation." S - Sensory play invites children to discover the world through their five senses. Both children and adults retain the most information when the senses are engaged. They are direct pathways to the brain, creating more vivid and easily summoned memories. What does the smell of fresh grass remind you of? U - Understand the cognitive, social, and academic benefits of play, as you add one or more fun activities into your daily routine. V - Variety is the spice of life! Kids can play alone or in groups, outdoors or indoors, on the playground or deep in the woods. There are endless kinds of toys and crafts to investigate. Each one of these play opportunities has unique benefits. X - Xylophones are awesome! Playing music "ignites all areas of child development: intellectual, social and emotional, motor, language, and overall literacy". Music and dancing create fluid connections between the body and mind. They also provide a means of self-expression for kids! Y - You should play too! Adults need to play too; it keeps the mind supple, the heart open, and the imagination thriving. What are your hobbies and playful activities of choice? Z - Zest! Play adds spontaneity and zest to life. Many mundane daily activities such laundry, cleaning, and cooking can be energized when you turn them into games. We hope you enjoy this playful alphabet of reasons why play matters! What reasons for each letter can you think of? How about the first letter of your name? Sounds like a fun game!